AeroMIDI is a 3D MIDI controller for Mac and Windows. AeroMIDI uses 3D input devices to track your hand in space allowing you to control any MIDI software or MIDI hardware. AeroMIDI allows you to use your hands in 3D space to trigger notes and MIDI continuous controller messages. AeroMIDI works with any MIDI software or hardware! Control synthesizers, lighting rigs, DAWs, effects, virtual instruments, and any other MIDI-capable hardware or software with AeroMIDI! To get started, just plug the Leap Motion Controller into a USB port. 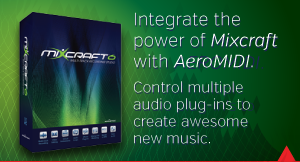 Load and install the AeroMIDI software and start your MIDI software or an external synthesizer. It works with any MIDI software or hardware! Control synthesizers, lighting rigs, DAWs, effects, virtual instruments, and any other MIDI-capable hardware or software with AeroMIDI! AeroMIDI is the virtual 3D glue between your music and your hands.. Prepare to create and shape music in a whole new way. Don't miss any updates from Acoustica. Sign up now!